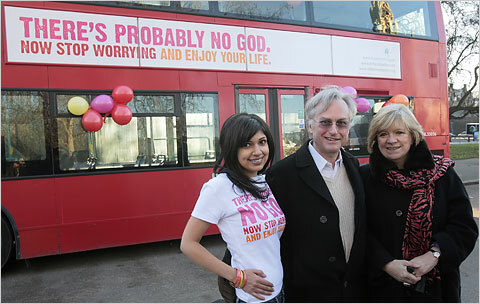 Comedy writer Ariane Sherine, (L) Professor Richard Dawkins (C) and Guardian writer Polly Toynbee (R) pose for pictures beside a London bus displaying an advertising campaign with the words: 'There's probably no God. Now stop worrying and enjoy your life," in London, on January 6, 2009. Ariane Sherine objected to the Christian adverts on some London buses, which carried an Internet address warning that people who rejected God were condemned to spend eternity in "torment in hell". She sought five-pound (7.80-dollar, 6.25-euro) donations towards a "reassuring" counter-advertisement -- and received the backing of the British Humanist Association (BHA) and atheist campaigner Professor Richard Dawkins. 800 buses around Britain will carry the slogans as well as posters on the underground system in London.